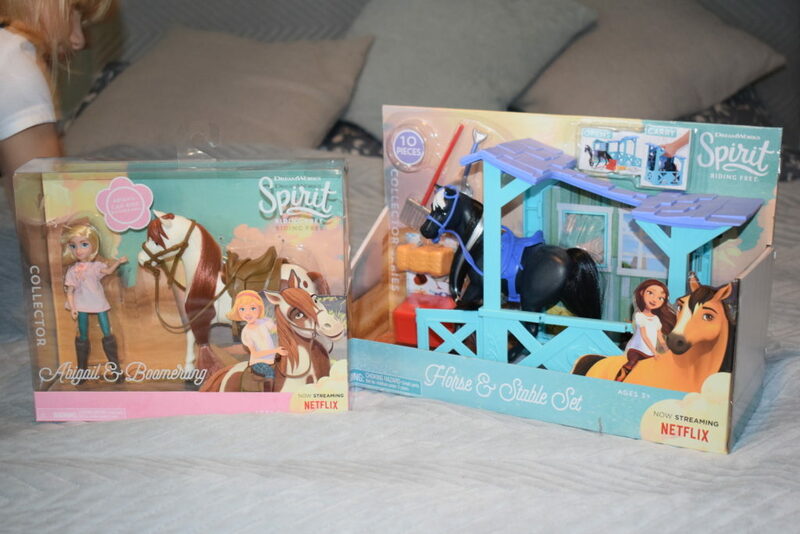 Disclaimer: I was sent these Spirit Riding Free toys and items to review free of charge, but words and pictures are mine. This post contains affiliate links, see more information here. If your children love horses and have Netflix Kids, then you will probably be familiar with Spirit Riding Free. 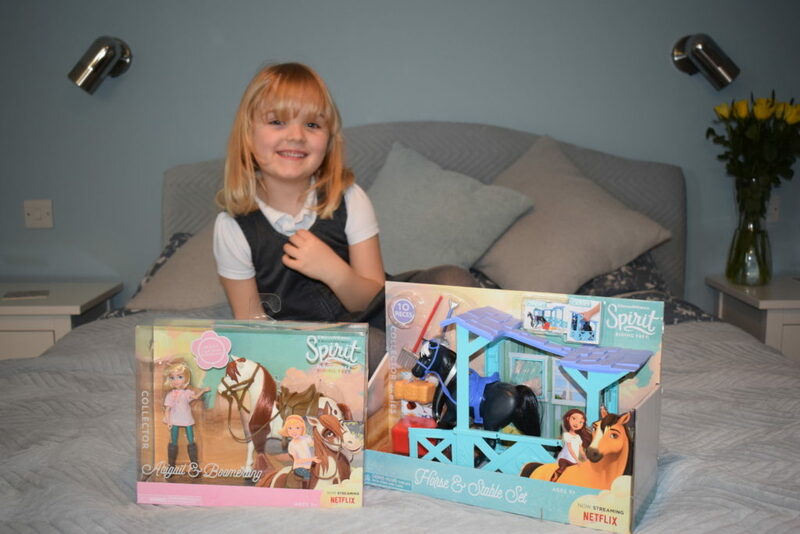 An animated spin-off from the popular Spirit film which came out in in 2002, each 25 minute episode of Spirit Riding Free follows 12 year old Lucky and her wild stallion Spirit, and her friends Pru and Abigail, with their horses Chica Linda and Boomerang. Since it first aired in 2017 there have been seven series of the show. My two both enjoy the stories and have worked their way through the episodes already available to watch on Netflix UK. This week (22nd March) sees the eighth series of DreamWorks Spirit Riding Free coming to Netflix. 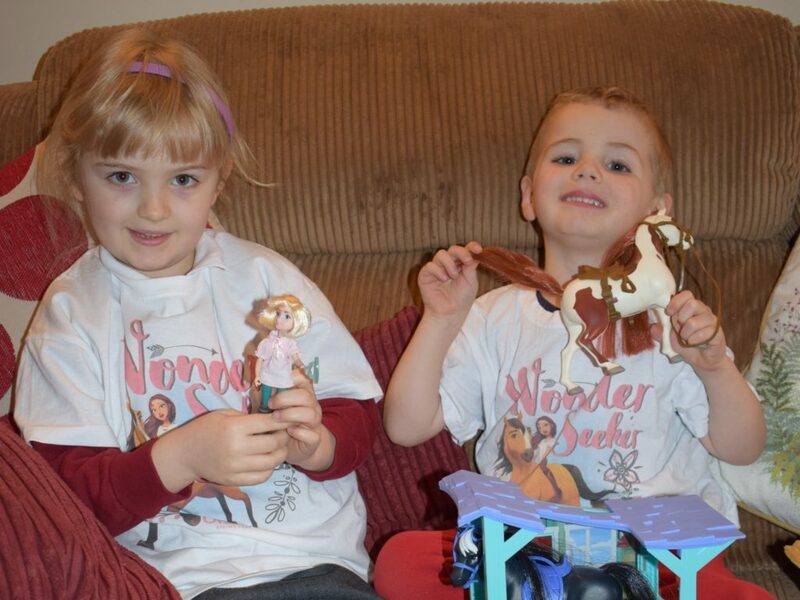 To celebrate we were sent an exciting selection of Spirit Riding Free goodies to review! 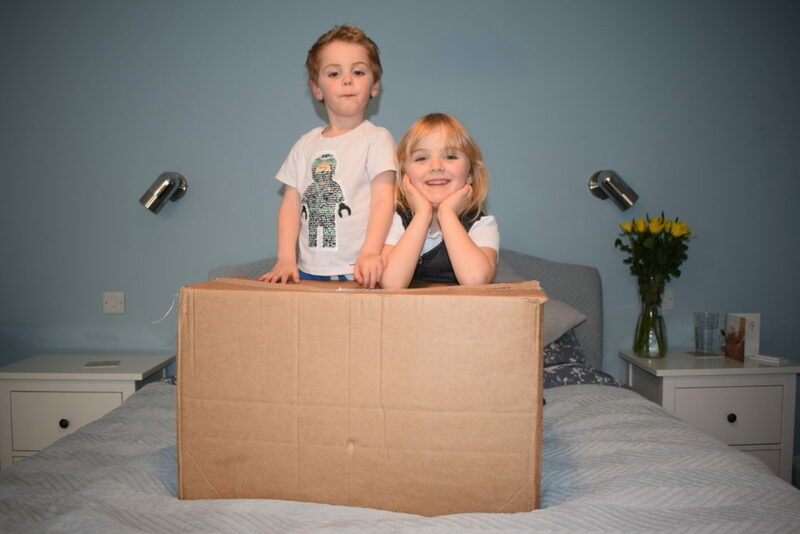 As you can imagine, there was a lot of excitement when the huge box arrived. Inside were Spirit Riding Free Playmobil playsets, Spirit Riding Free horse and stable toys from Flair and a lunchbox and water bottle. 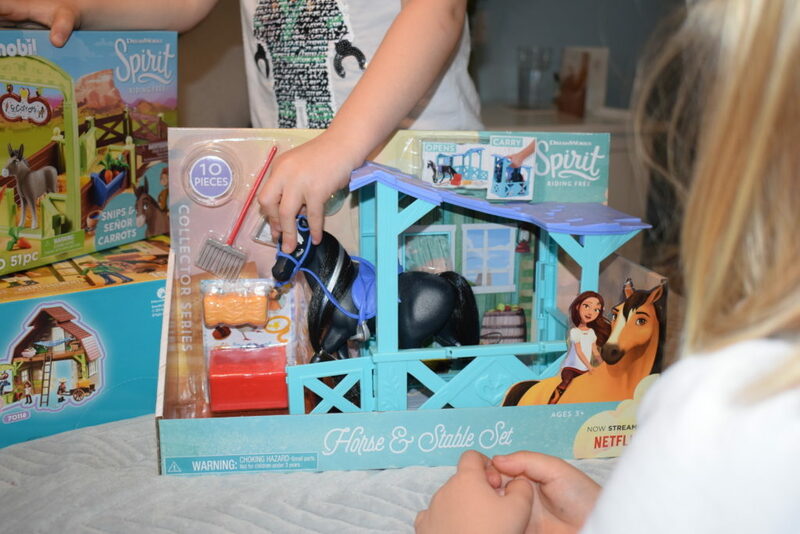 The first thing out of the package was the Horse and Stable playset with horse, stable and accessories, and an Abigail and Boomerang figure set, both from Just Play/Flair. 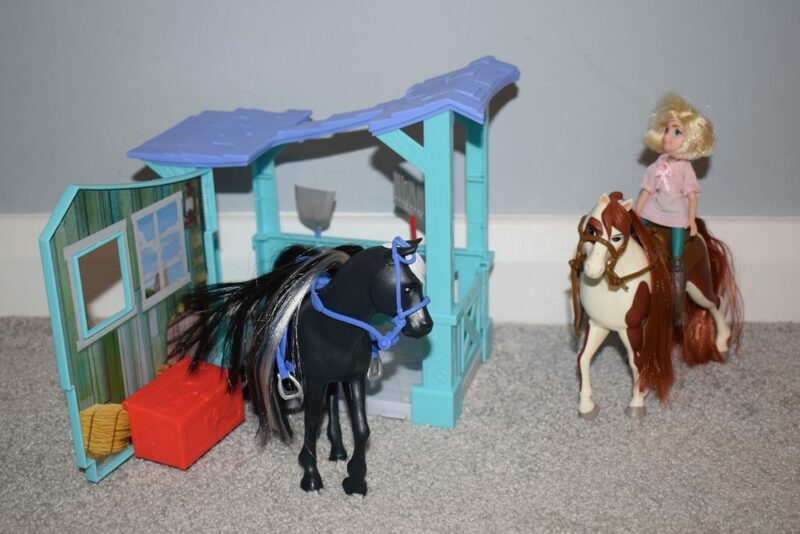 The Horse & Stable set comes with 9 pieces for make believe play; a 7 inch tall horse, a stable, a bale of hay, shovel, rake, saddle, bridle, grooming brush, tack box. 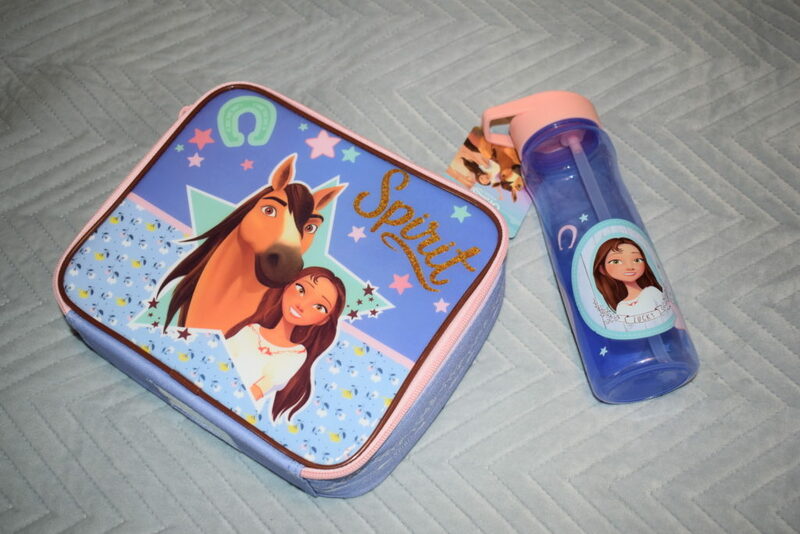 It also comes with a sheet of Spirit Riding Free stickers. The stickers on the inside of the stable are (thankfully) already in place so that you can start playing as soon as its out of the box (note you’ll need a pair of scissors to get it free!). 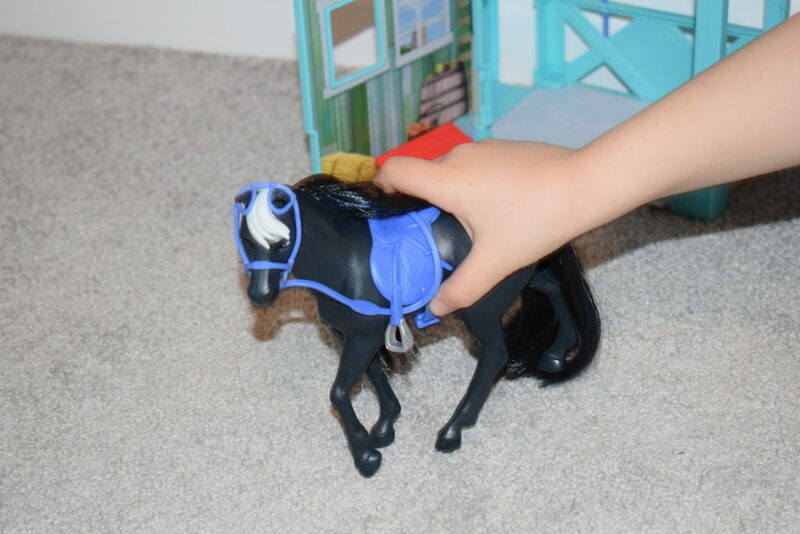 The side of the stable opens up, and you can pull out the end piece so it can be played with. It can then be closed down with the items inside it, to store and carry. 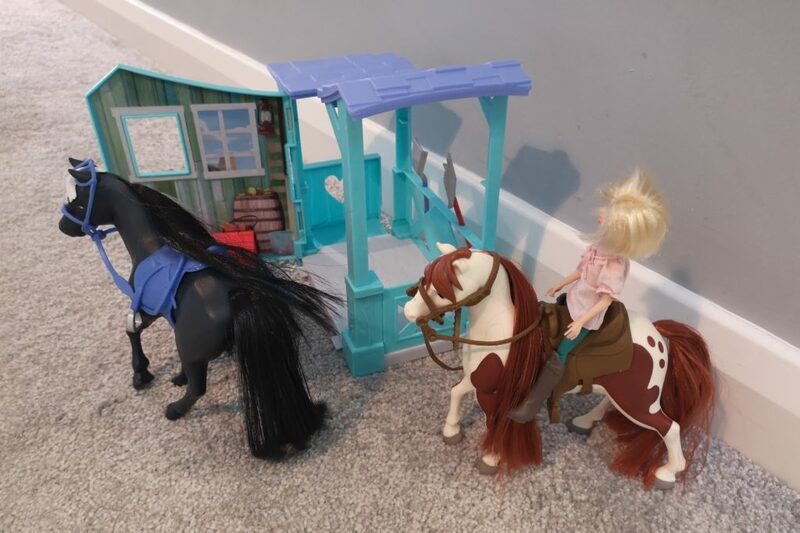 The Horse and Rider sets – available for each of the show’s three main characters – each contain a horse and one five inch articulated doll. We got my oldest’s favourite; blonde Abigail and her beautiful pinto horse Boomerang. The Abigail doll is 5 inches tall, with brushable hair and removable boots, and she has fully poseable arms and legs which means she can ride Boomerang. Both horses have long, brushable manes and tails. 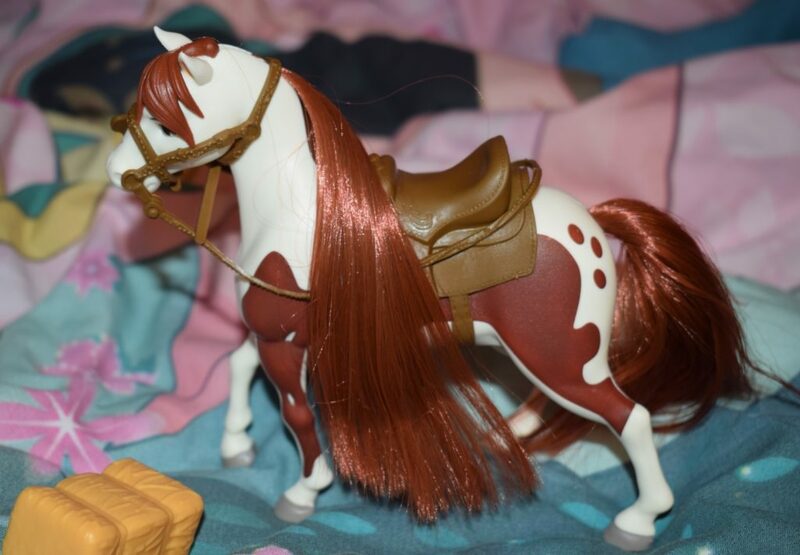 They are fixed in pose, and come with a removable bridle and saddle and can be ridden by any suitable 5 inch doll. 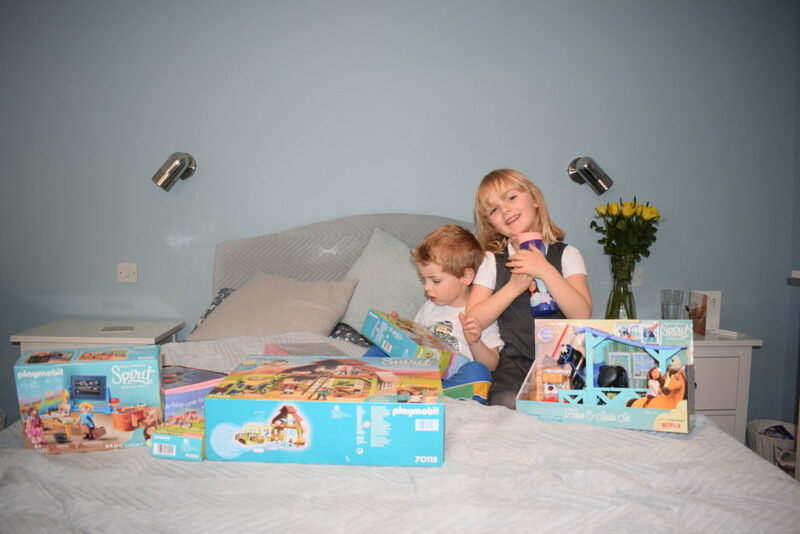 The playsets are suitable for children aged 3 upwards. 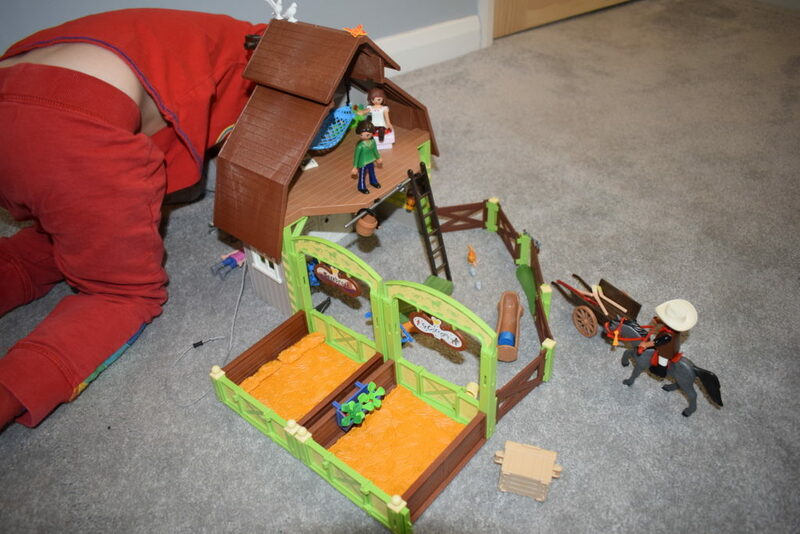 The horse and rider sets have an RRP of £15.99, and the horse and stable set retails at £24.99. Both sets, and others in the series, can be purchased from Smyths Toys. 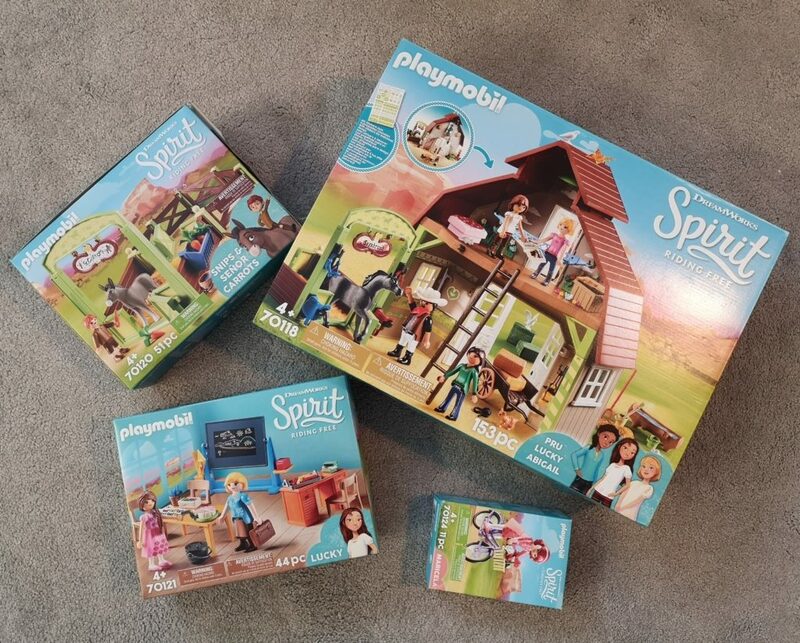 We are huge Playmobil fans and were really excited to try out some of the new Spirit Riding Free Playmobil Playsets. 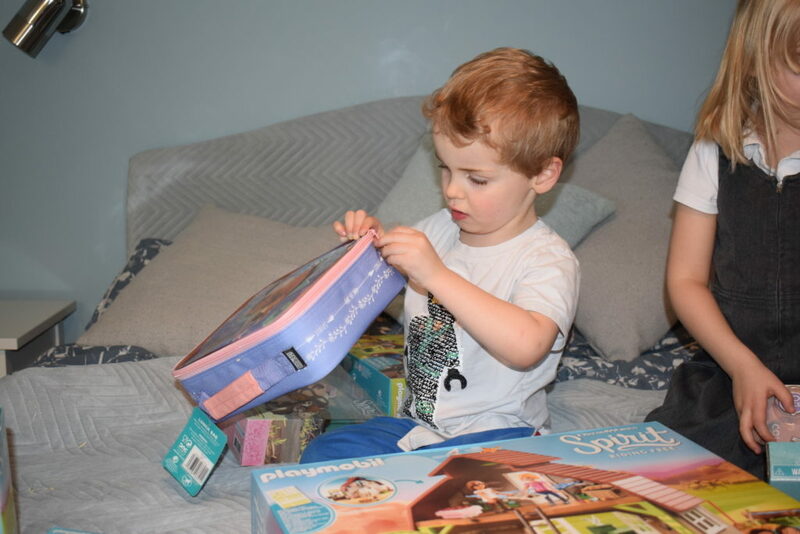 There are quite a few different sets, and we were sent the Barn playset with Pru, Lucky and Abigail, Snips and Senor Carrots playset, Classroom and Lucky playset and Maricela with a bicycle. 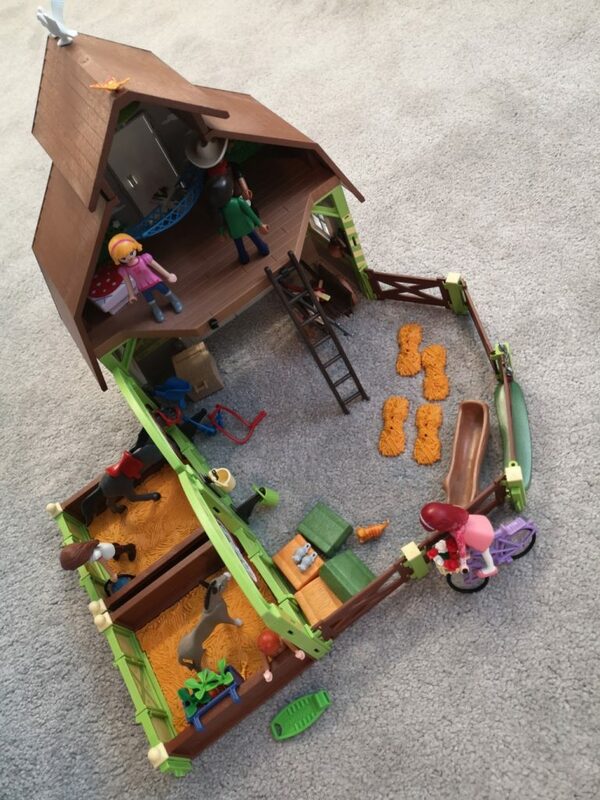 The Barn is a large 153 piece playset complete with building, stable, four characters and a horse as well as a whole bundle of accessories including birds, cat, mice, trough, tack, wagon,hay, hammock, seat and buckets. It is suitable from age 4, but it needs an adult to put it together as the instructions are a little complicated and stickers need to be placed precisely (which I’m rubbish at, but my kids are worse!). The barn has two floors and a door to each level, and comes with one stable for Sagebrush the horse. 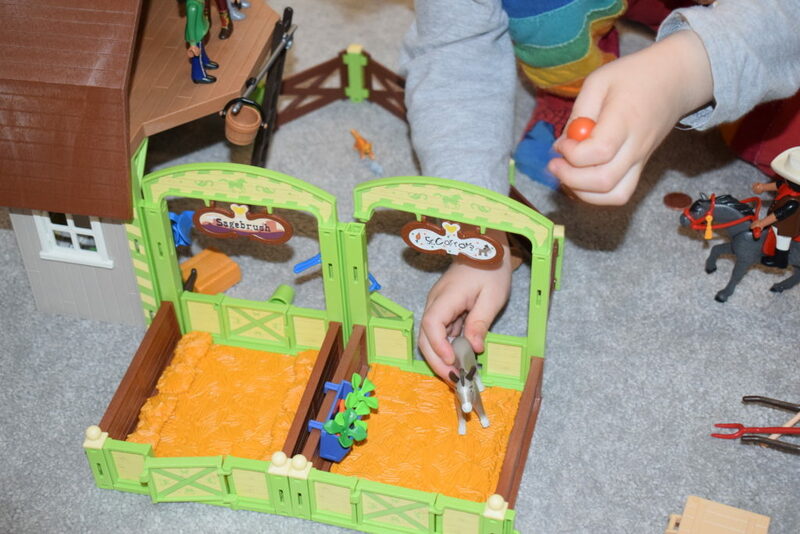 Our pictures show the barn joined together with the Snips and Senor Carrot playset, in which you get Snips and his donkey Senor Carrot, a stable plus fencing and accessories. There are several different sets and you can join them together however you’d like using the slot-together pieces to create your very own ranch. There are also additional characters you can buy such as Maricela to add to your playset. The classroom set doesn’t come with a building, but two characters plus many accessories which you use with your existing Playmobil sets. For this reason I’d say it is probably for slightly older children (aged 5/6+) who won’t immediately lose all of the pieces. 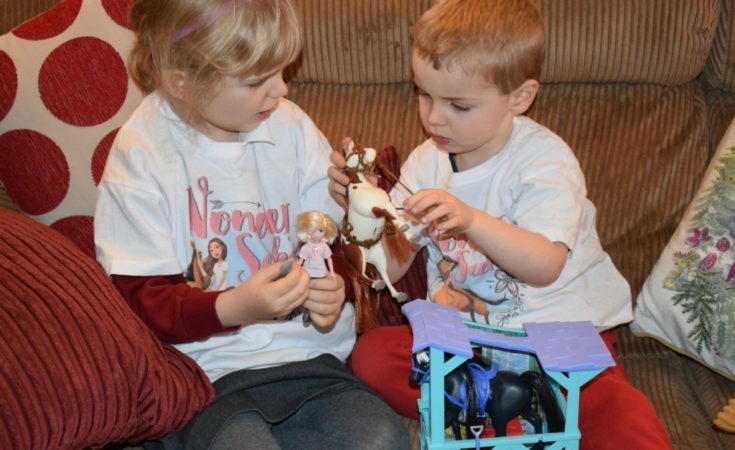 The barn has an RRP of £59.99 and is available on the Smyths Toys website alongside the larger Spirit Riding Free Lucky’s Happy Home playset, and some of the smaller horse and rider playsets. The other sets featured are available from nationwide retailers and on Amazon. They are priced at £17.99 for Snips and his Donkey Senor Carrot, £19.99 for the classroom playset and £6.99 for Maricela and her bicycle. Lastly we were sent a lovely insulated lunch bag and water bottle; perfect for school! These will be sold on Amazon this month (and I’ll pop a link here when they are available). Be sure to catch the new series of Spirit Riding Free on Netflix from 22nd March 2019. For more information, follow the show on Instagram, Facebook and Twitter!